I've hit that lovely spot in pregnancy where the nesting phase hits hard. Real hard. I want to buy all the things, organize all the things, wash all the things and reorganize all the things I just organized. Both of my baby showers are this month, which I'm super excited about, but that also means I can't really buy anything until we know what we're getting. And right now, for me, that's hard. Because of the crazy nesting need. So I've found other ways to nest and prepare. My biggest project right now is freezer meals. Two of my closest friends both told me that they wished they had prepared more freezer and crock pot meals when they were pregnant. And I read a lot of blogs that said the same. I don't particularly love cooking right now (hello, tired!) and can only imagine that feeling getting worse with a newborn. Or as I get closer to my due date. 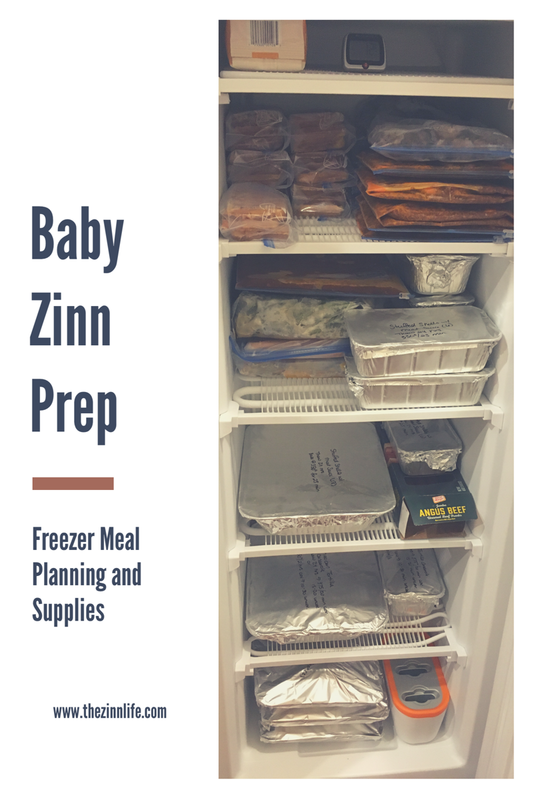 So I sat down and made a freezer meal plan. I determined that I wanted to have approximately three months of meals ready to go. That sounds like a lot, because it is a lot. Do I actually think I will have a full three months ready? Probably not. I'm at about a month and a half right now and hope to get to two months' worth. My goal is to have most of it done by February, when I'll be in my last month of pregnancy. This gives me one month of pregnancy and two months post partum of having to do very little cooking, if at all. Aaron even volunteered for me to teach him so he could help me out when it came time to do any cooking. I love him. My biggest complaint with freezer food is that it's a bunch of pasta and casseroles and not a lot of good, healthy options. I also get tired of eating the same thing day in and out. But by doing one big meal and then mix and match meat options, we have choices. Choices are glorious. I could do ground beef and use that for tacos, spaghetti, or pizza. I could use frozen grilled chicken for salads, sandwiches, etc. From there, I had to figure out how to store all this mess! Step one was finding a freestanding freezer. I abhor the freezer that came with my refrigerator. It has four buckets, which aren't conducive to freezer meals, freezing cakes or anything like that. 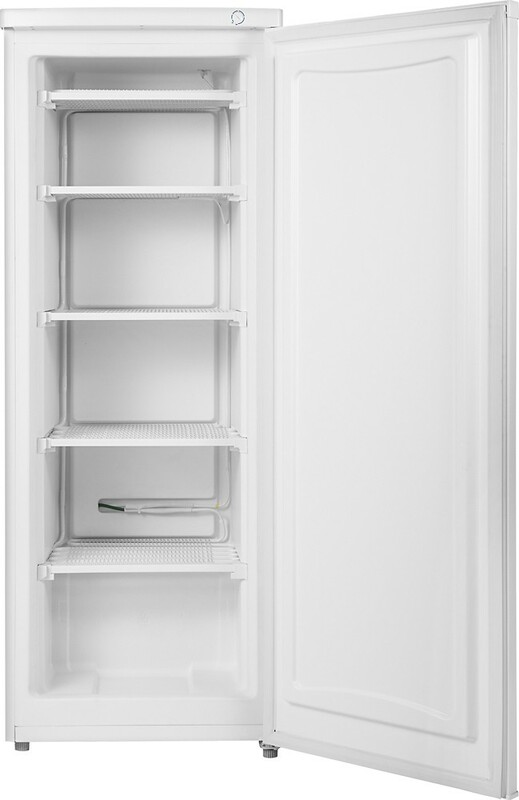 I knew that if I was going to take this project on, I needed a separate freezer. Originally, I was just going to do a freezer chest, but then I found out about upright freezers. This is the freezer we ended up getting. It's only 5.8 cubic feet, so it isn't huge, but it also has a ton of storage space! It doesn't have automatic defrost, but for less than $200 (we paid $180), I can handle that. I love that you don't have to dig around like you do in a freezer chest, everything is right there out in the open. The shelves are nice and deep. The top shelf fits a frozen pizza really well. The other shelves can hold three 9x13 pans. The bottom part also holds a 12 pound turkey quite nicely! These are also great for flash freezing meatballs, waffles, etc. in your freezer before packaging them up! I had also planned to use plastic containers like PW used, but I decided that given the amount of space I had, the bags would be more efficient. Third shelf - I'm going to use this shelf for my large meals that I'm storing in gallon size bags. I also have some loaf pans for single night meals. I should be able to do 6 gallon size bag meals and 3 loaf pans. Fourth Shelf - I'm going to use this shelf for a combination of 9x13 pans and gallon size bags. I can fit three 9x13 pans on these larger shelves, so I should be able to get at least two 9x13 pans and two gallon size bag meals, for a total of 4 meals. Possible 5 depending on what is in the gallon bags. Open space at the bottom - this is for whatever else I need to store, but haven't had room for. Tomorrow, I'll share the recipes I've planned to use. Some I've already made, some are going to be brand new! I've looked long and hard for a good variety of meals, so be prepared to be excited to eat what's in your freezer!